This is something I missed growing up with US public school history. Yugoslavia? Huh? I managed to pretty successfully avoid the subject through an undergrad history degree, too. Hmm, the Balkans, is that some mountains or a peninsula or something? Finally, as a 20-something, I was tasked at International Mapping with helping out on the Croatia v. Slovenia Permanent Court of Arbitration (PCA) case. And while there was no glory or travel in the work I was doing—digitizing old topo maps—it served as a decent primer on the region and an opportunity to catch up on some missed history. Now, after writing the reports for all of the Adriatic maritime boundaries, many of which stem directly from Yugoslavia in the 1970s, I am obsessed with this fascinating, beautiful, and conflict-ridden region. The Balkans are complicated. Even its geographic definition is disputed, with most people preferring the term “Southeast Europe” to better define the area today. As a not-quite peninsula, the Balkans were named in the early 19th century after a mountain range in modern-day Bulgaria, which was mistakenly thought to be the dominant geographic feature of the area. Most people consider the northern border of the Balkan Peninsula to be a series of rivers, most notably the Danube. To the west of the Balkans is the Adriatic Sea, to the south the Ionian Sea, and to the east the Aegean Sea and Black Sea, making it kind of, sort of, a weirdly shaped peninsula. 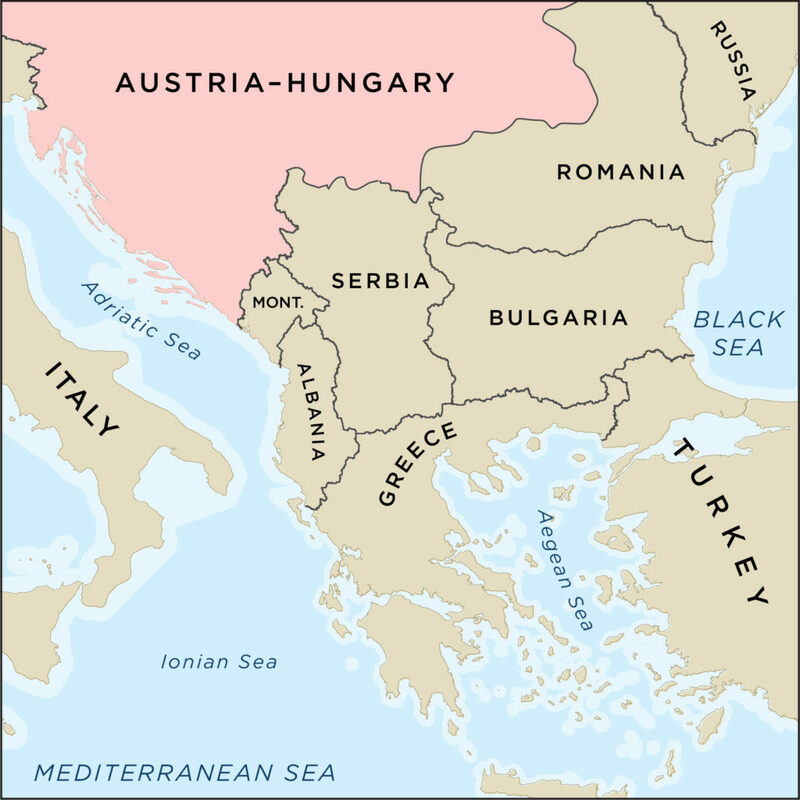 The modern-day states which make up Southeast Europe are Slovenia, Croatia, Serbia, Bosnia and Herzegovina, Montenegro, Kosovo, Albania, North Macedonia, Greece, Turkey, Bulgaria, and Romania. Some of these are excluded from lists of Balkan States for geographic or political reasons (which is one reason why Southeast Europe has become the preferred term). The political history of the Balkans is even more complicated than its geography, with major players over the centuries including the Greeks, Ottomans, the Austro–Hungarian Empire, and the Soviets. Its cultural and religious history is even more difficult. Today, the region is not known for its peace and stability. To examine just a small portion of time and geography, I will be focusing on how Yugoslavia came to be and then not be. A modern-day Balkan “Peninsula,” the northern “boundary” in red. Yugoslavia was born after World War I from remnants of the Austro–Hungarian Empire in Southeast Europe, with the union of the Kingdom of Serbs, Croats, and Slovenes. 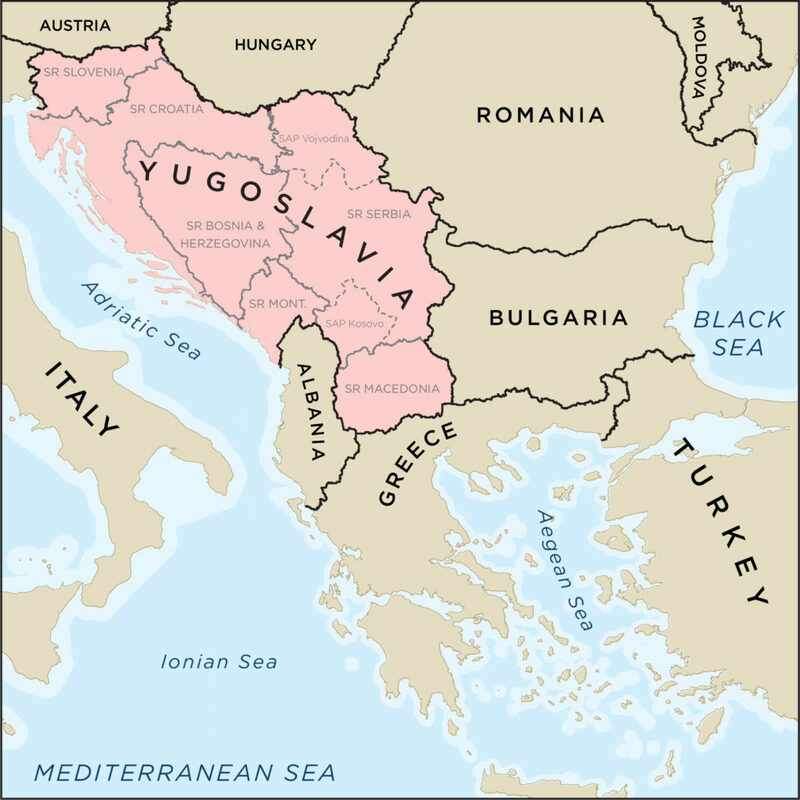 In 1929, the state was renamed the Kingdom of Yugoslavia. The Austro–Hungarian Empire on the eve of World War I. And then World War II happened. Yugoslavia was invaded by the Axis Powers. Cue several puppet regimes, Soviet control, and the eventual rise of Josip Broz Tito who would hold together Yugoslavia from 1945 until his death in 1980. While Tito modeled the new Socialist Federal Republic of Yugoslavia (SFRY) after the Soviet Union, he would eventually fall out with Stalin, and communism in Yugoslavia would take on its own unique form. Within the SFRY were the Socialist Republics of Slovenia, Croatia, Bosnia and Herzegovina, Montenegro, Macedonia, and Serbia. The SR of Serbia included two semi-autonomous provinces: Vojvodina in the north and Kosovo in the south. A map showing the internal boundaries of Yugoslavia from this time would look familiar to the modern geography enthusiast, except for maybe Vojvodina (which is still an autonomous province of modern-day Serbia). These internal borderlines would become the international boundaries between independent states with the disintegration of Yugoslavia in the 1990s, though not without their problems. The SFRY started to fall apart after Tito’s death in the spring of 1980. The central government of Yugoslavia was never meant to be one of strength, with most of the power resting in the republics or even within the 500 communes from which they were made. President Tito was replaced by a rotation of regional leaders in an attempt to keep Yugoslavia together. It failed. Independence movements abounded in, and within, the various republics. And by 1990, the Yugoslav Wars were in full swing. The Socialist Federal Republic of Yugoslavia. Croatia and Slovenia were the first to declare independence, together, on 25 June 1991, although fighting continued there, especially between Croats and Serbs within Croatia for another four years. Macedonia followed shortly after, declaring independence in September 1992. They were the only state to breakaway peacefully. Macedonia maintained good relations with Serbia and the rest of its neighbors. But not so much for Bosnia and Herzegovina. Independence was attempted in 1992, but Bosnia and Herzegovina immediately went to war with itself. Bosniak Muslims and Croat Catholics fought against Serbian Orthodox Christians who had official and unofficial support from what remained of Yugoslavia and the SR of Serbia. The Bosnian Serbs took on the name of Republika Srpska after it lost direct help from Yugoslavia when Bosnia and Herzegovina gained UN recognition as an independent country. Peace was eventually brokered after a NATO bombing, and Republika Srpska rejoined Bosnia and Herzegovina as a federation. Meanwhile, the SRs of Serbia and Montenegro remained united under the Federal Republic of Yugoslavia, eventually being renamed Serbia and Montenegro until Montenegro’s independence referendum in 2006. In 2008, Kosovo declared independence from Serbia. Today, Kosovo’s independence is generally recognized, but it continues to be disputed by Serbia. In addition to war, Yugoslavia left behind a legacy of boundary disputes. All of the former Yugoslav states recognized that their borders as republics are now international frontiers, but what exactly does that mean forty years later? 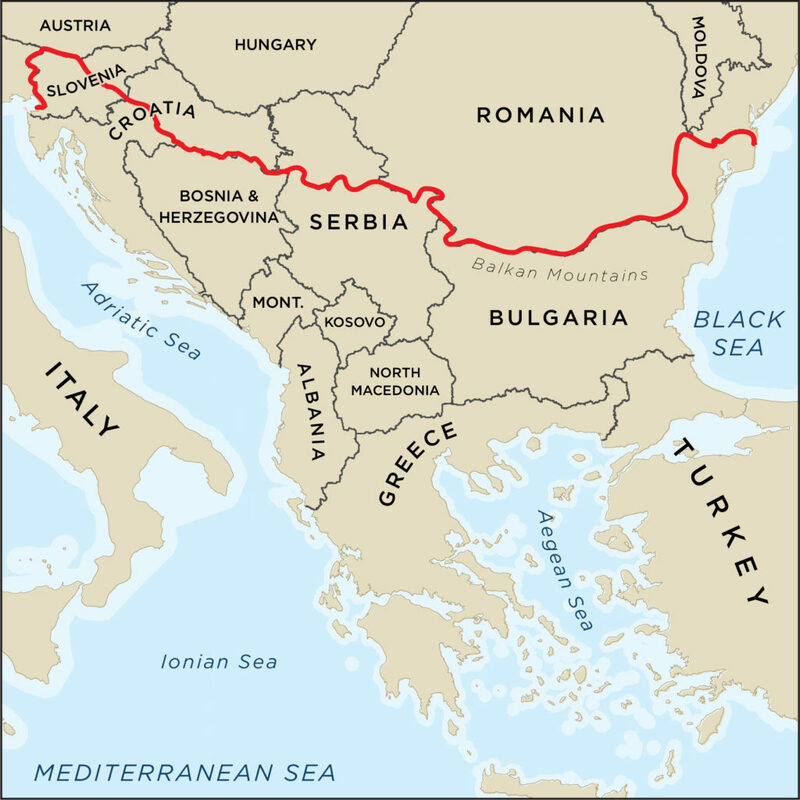 If a river (the Danube, for example) separated the SR of Croatia from the SR of Serbia but that river changed course since the 1950s (it has, a lot), what is the international boundary today? Is it the course of the river from the time of the internal Yugoslav lines (Croatia’s claim) or is it the modern course of the river (Serbia’s claim)? Croatia has these problems with every single one of their former Yugoslav neighbors. North Macedonia is the only state born out of Yugoslavia to not dispute any of its borderlines. It recently resolved a conflict with Greece over its name by agreeing to the Republic of North Macedonia instead of the Former Yugoslav Republic of Macedonia.